First, sign in with Twitter. 1. Tap the big button in the far right! 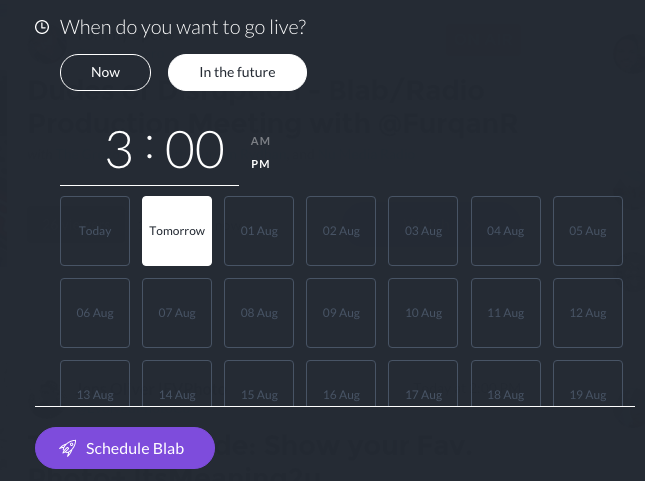 Blab is for conversations, so your Blab will go live and push out to users when there are 2 people on camera. If you had someone in mind you’d like to talk to, shoot them a link! Make sure you and your caller accept the video and audio permissions on chrome! The person you invited (or maybe you didn’t invite them) is trying to call-in to your Blab! Accept the call to let them jump on the video and get the show on the road! Not everything that happens on Blab is “on the record,” but we do leave it in control of the host! 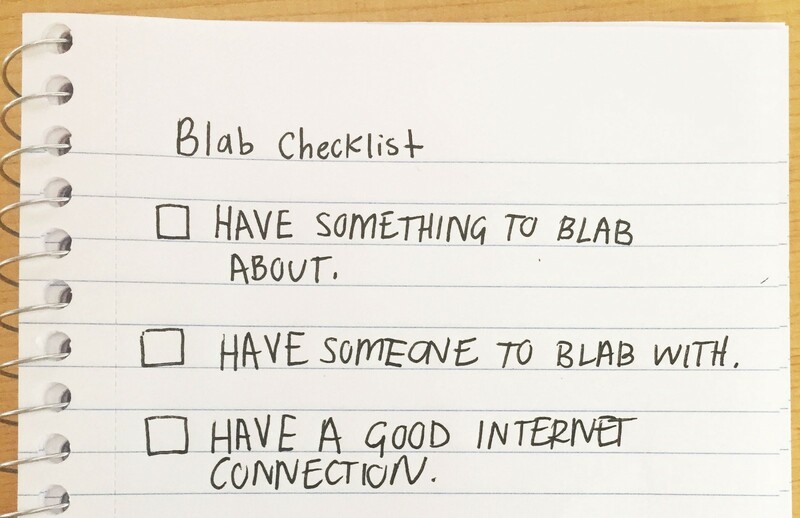 You can stop the blab at any time! You can even pause the recording and go “off the record” and it’ll be cut from the final recording! Recordings are 6 hours max! When the blab is over you will get an email with the audio, video and embed links! Replay is available for people who go to the link once the Blab has ended! We know you’re not a robot, so why should you have to tweet out like one? Building up your audience on Blab will provide you with a live audience for all your Blabs! Spontaneous comments, or even a video appearance are likely to happen! Engaging and passionate hosts tend to attract large numbers of followers. As a host, you get to accept callers into the Blab, and kick them out as well. You cannot control who is in the comments, yet. 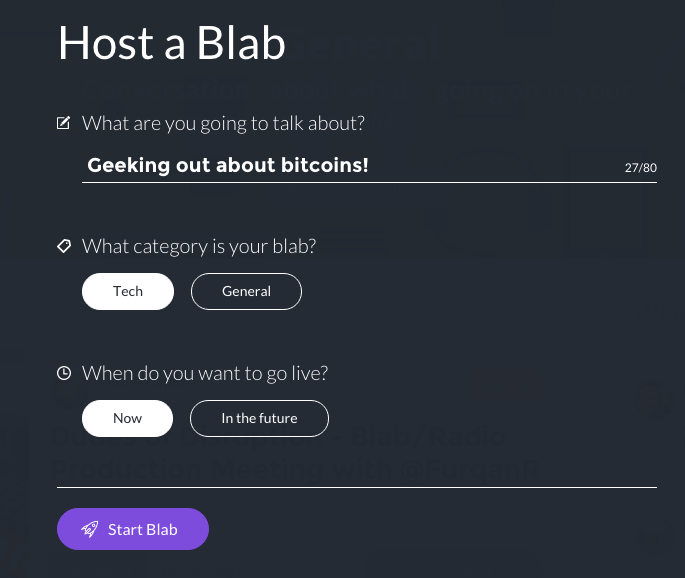 The host can change the topic using /topic command in the chat, but the guests can ALSO change topic of the Blab. The host can also decide if the Blab is on or off the record. They will get the downloadable MP4, MP3, and embed code once the recorded Blab has ended. We are planning on adding more host controls as well. You’re going to schedule a Blab the same way you would start one. Sometimes giving more advanced notice to your audience will help your followers grow. 1. Tap the same big button on the top right! 3. Tap “in the future” and set up a time! The Blab community is extremely helpful, and who better to give new Blabbers some welcoming advice? Stuck? I’m happy to help! @brittanymetz @TeamBlab Technical troubles? @FurqanR has your back!